‘Badger’ has been immortalised in Kenneth Graham’s Wind in the Willows. His character is accurately portrayed as a powerful creature not to be trifled with, yet one who is shy and retiring it seems, reclusive. It is true, badgers are seldom seen as they are generally only above ground in the hours of reduced light, darkness or early morning, when most of us are indoors tucked up in bed. In the UK, badgers are neither uncommon or currently endangered, other than by the activities of Man. Persecution of badgers still continues however, and it is commonplace in the North of England for setts to be attacked and the animals killed or taken for other so called ‘sporting’ purposes. This has led to a large number of setts being reinforced by local badger groups. Thankfully the frequency of attacks on setts in Southern England is fewer, though still all too frequent. The European Badger (Meles meles) is a member of the family Mustelidae belonging to the same family as the otter, pine marten, polecat, stoat, ferret and weasel. However it’s lifestyle in comparison to the other members of its family differs considerably. The badger occurs throughout most of Europe, with sub-species in all of the other continents, with the exception of the Arctic and Antarctic. Most of these sub-species vary only in small respects from our own ‘Brock’. Distribution in the UK is rather patchy, with Scotland having large areas bereft of this lovely animal. The water table of northern East Anglia does not lend itself to the badgers’ lifestyle either. The badger is a powerfully built animal with tremendous upper body strength which is evident when you examine it’s prodigious digging capabilities. 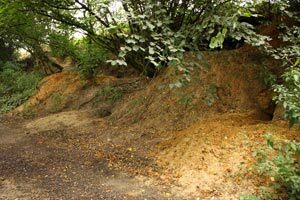 Often the establishment of a sett will involve the removal of literally tons of soil, which can be seen as huge amounts of spoil outside sett entrances. The badgers’ powerful shoulders and front legs are complimented by large front paws (5 digits each) with greatly elongated thick, sharp claws. The legs, however, are fairly short which makes then ideal for the digging function. 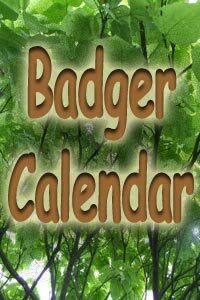 The badger is a large animal by UK standards and has a high size/weight ratio. Weights do vary considerably depending on geographic location and time of year. The animal is likely to be at its heaviest in the period from October to January, and lightest around March to May when all surplus fat has been used up. According to studies undertaken, a full grown male badger in Southern England can weigh anything from 9.1 to 16.7kg. Females in the same area and in the same age range can weigh from 6.5 to 13.9kg. Greatest weight changes occur in adult sows due probably to lactation. Length again can vary considerably. The average length from nose to rump excluding the tail averages at 753mm for boars and 724mm for sows. The average total length is 903mm for boars and 874mm for sows. 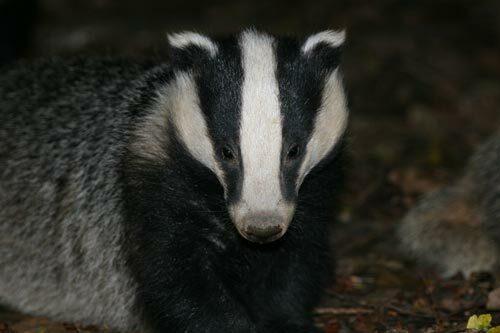 Badgers mate at any time of year, but the embryo does not implant in the womb and start growing until winter. This is called delayed implantation and means that most cubs are born from January to March. The average number of cubs is 2 to 3. At birth they are about 12cm long with fine fur and their eyes are closed for at least 12 weeks. They are not independant of their mothers until about 15 weeks of age. 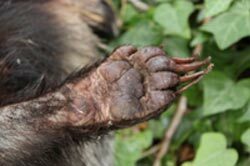 The skin of the badger is extremely loose, and has been described as having a rubbery texture. This makes the badger difficult to grip for any attacker, it would be a rash dog that alone attacked one. The coat consists of long guard hairs often longer than 100mm in the winter coat. These are supplemented by a thick under coat which is light in colour. The guard hairs, which are oval in section, are pigmented with melanin which results in a band of darker pigmentation about 20mm long towards the tip of each hair. Therefore overall the badger looks predominantly grey in colour. Hairs of the head and neck are short and white except for the well recognised black stripes of the head. The badger’s underside is sparsely haired, not dissimilar to the average breed of terrier dog. Badgers moult once a year. The eyes of the badger are further toward the snout than one would expect given the overall shape and mass of the head. The badger’s sight is not believed to be as important as it’s other main senses, though studies suggest that despite the fact that its eyes are quite small, they are well developed. Its light collection capabilities give the badger reasonable, though not outstanding night vision and generally good normal eyesight. The badger’s sense of smell is extremely well developed and of considerable importance. This is evidenced by the structure of the creature’s olfactory organs. On emerging from the sett a badger will first carefully test the air, and if you are up wind of him he will sense your presence immediately and most probably disappear for at least half an hour. The badger has a large collection of muscles which are available to power the lower jaw. The great pressure generated by the muscles powering the jaw has necessitated the evolution of the jaw joint with the skull, such that it is impossible to dislocate the jaw without fracture. 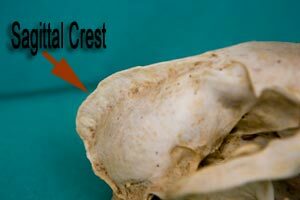 The immature badger has no ‘crest’ along the skull centre. This appears by the time it reaches a year old, being a coalescence of ‘Temporal’ ridges which first appear when a badger is about eight weeks old. 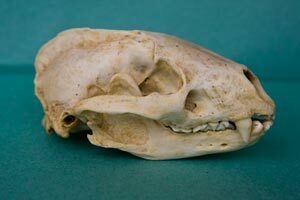 As the badger gets older, this ‘Sagittal Crest’ tends to overhang the back of the skull. Milk teeth first appear at about 4 weeks after which time they progressively populate the jaws until they are 32 in number. Brock will normally develop all his adult teeth by the time he is about four months old and will number 38 in total. The layout and development is typical of an omnivore. The badger is formally classified as a carnivore, though favourite foods seem to be peanuts and sweetcorn – hardly the diet of a carnivore! Despite classification the badger is an omnivorous creature and will eat and thrive on a wide range of foods. He is as happy chewing on a dead crow or other carrion as he is consuming juvenile rabbits, mice and other small animals. The largest single source of food for badgers though is, however, the humble earthworm. Studies indicate that the earthworm constitutes at least 50% of the badger’s staple diet. The badger sett can be extensive. It can involve the excavation of tons of soil and can also be very old. Records exist claiming setts that are still active today, were first recorded towards the end of the 18th century. The sett itself is most probably even older. On occasions, badgers will use an external nest, usually in summer to early autumn, although breeding nests above ground are rare. The badger is a very clean and fastidious creature. Bedding is frequently aired outside the sett and changed regularly. One can often see balls of bedding outside the sett, left there to ‘air’. Bedding generally consists of grass, straw, bracken, leaves or any other material the badger finds acceptable or is readily available and provides reasonable insulation.